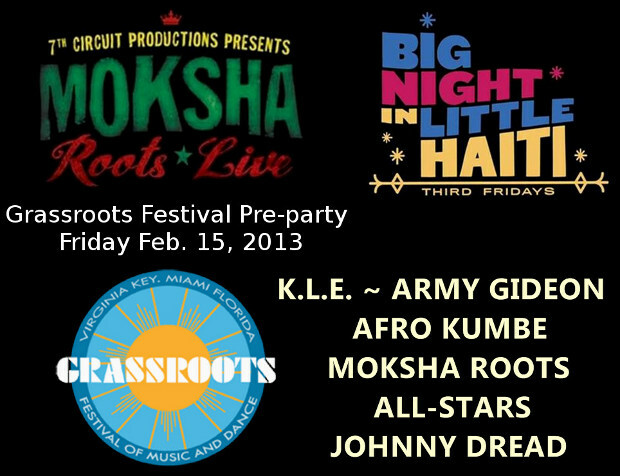 The Virginia Key Grassroots Festival and Moksha Family Arts Collective present Moksha Roots Live, also the official after party for The Rhythm Foundation’s Big Night in Little Haiti. Come out and vibe with us, support this ongoing monthly gallery opening, roots jam and down tempo experience bringing together all the diverse cultural roots of Miami. Army Gideon is a high energetic band of musicians with an extensive library of live music and songs of freedom. While maintaining a historical background of Caribbean and African roots, Army Gideon is based out of Fort Lauderdale, FL. Caribbean Mash Up Masters, Locos por Juana, new Side Project, using Electronic Elements with Colombian Folklore Pecussion. The gallery is always featuring many world renowned visionary artists as well as our local Miami Artists. Keeping the Moksha Art Fair vibe alive we bring you the “PYRAMID SESSIONS”, world dub, downtempo, psybient music. All-night “You’re the Cure” celebration at Pyramid Sessions including visual art, fire dancing, and a live performance by Unity is Change that will inspire you to bring balance to yourself! Available Now – 4 DAY TICKETS to The Virginia Key Grassroots Festival at reduced prices + Moksha Bonuses! CALL for Tickets 305-757-7277 . Tickets may also be purchased at The Pre-Party.